Simply spray this fast acting cleaner on desktops, cabinets and painted surfaces and then wipe off. Nonabrasive office cleaner cuts through the grease and dirt that collects. Nonoil, nonstick foaming action prevents running on vertical surfaces. Excellent for all surfaces including desktops, office furniture, cabinets, painted surfaces, plastic surfaces and luggage. Nonflammable cleaner leaves surfaces clean and shiny with oily or sticky residue. 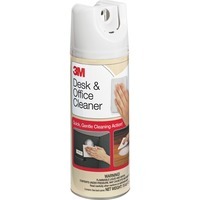 Office cleaner contains no chlorofluorocarbons CFCs.